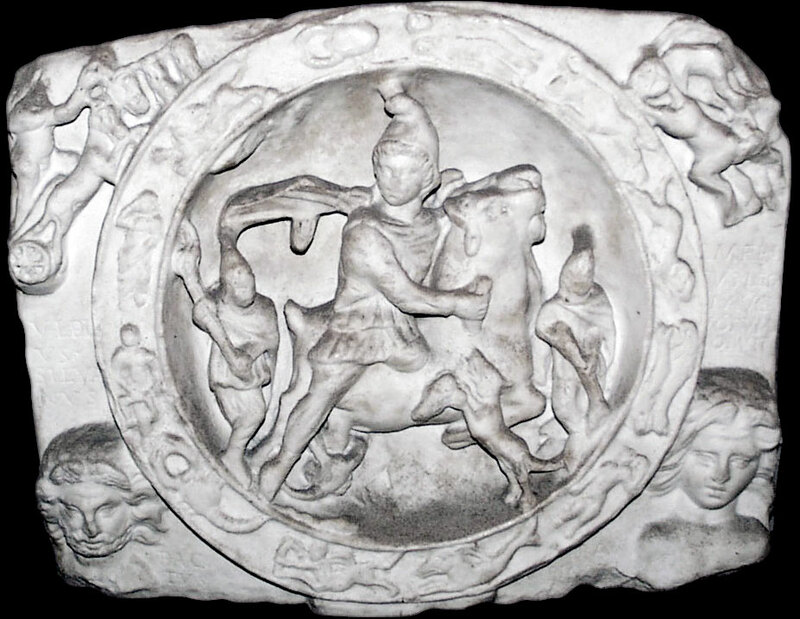 White marble relief (H. 0.38 Br. 0.55 D. 0.08), found together with nos 812 and 813 in London's City near Walbrook (1889). At first in the Coll. F. Ransom at Hitchin; from 1915 in the London Museum, Inv. No. A 16933. MMM II 389f No. 267a and fig. 304; Hinks in Bruton, Fort Manch., Pl. 15; Haverfield in Archaeologia LX, 1906, 43ff and fig. ; Cat. Rom. Brit. Sculpt., fig. 12; JRS 1911, 163 and Pl. XXIV, I; RRR II, 450, 2; MM, III fig. 4; Wheeler, Rom. London, 170 No. 2 and Pl. X; London Rom. Times, 45, Pl. XVII; Saxl, fig. 141; Collingwood, Rom. Brit., 6; fig. 55. Fig. 218, received from Dr W. F. Grimes, Keeper of the London Museum. 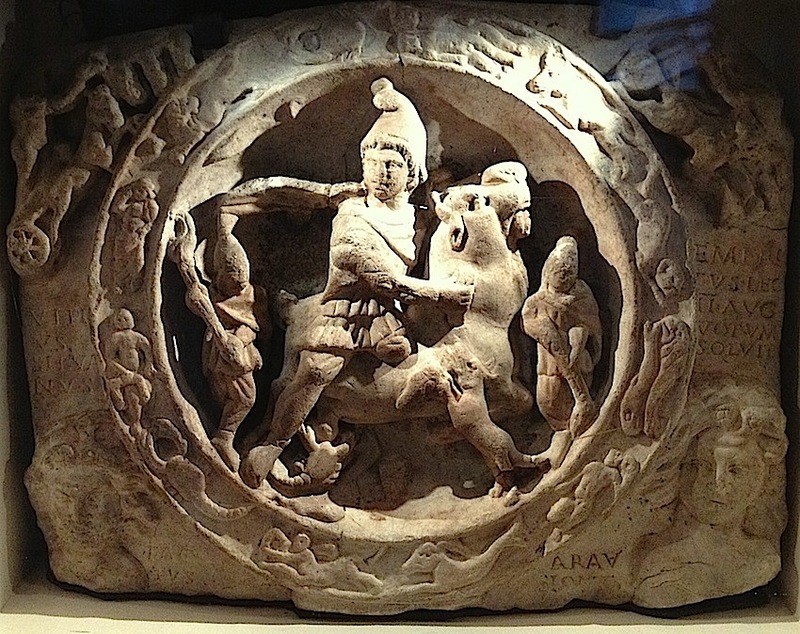 In the middle of the relief the' representation of Mithras tauroctone. A part of the god's flying cloak with the raven are lost. The dog and the serpent with their heads near the wound; the scorpion at the testicles. On either side a torchbearer: Cautes (l) and Cautopates (r). This main scene is surrounded by a broad circle, in which the signs of the Zodiac. Beginning at Cautes' feet we see subsequently: Scorpio-Virgo-Leo-Cancer-Gemini-Taurus-Aries-Pisces-Aquarius-Capricornus-Sagittarius. In the upper corners of the left Sol's quadriga driving upwards (damaged), and on the right Luna's biga, drawn by two bulls. Luna's head has got lost. In the lower corners the naked busts of two Winds, both with long hair and with two wings on their foreheads. The left is bearded, the r. one is more youthful. Ulpius Silvanus / factus Arausione / emeritus leg(ionis) II aug(ustae) / votum solvit. This is RIB 3, which translates the inscription as "Ulpius Silvanus, emeritus of the Second Legion Augusta, paid his vow; enlisted at Orange."